Image kindly released by the Tate under the Creative Commons CC-BY-NC-ND (3.0 Unported) license. The children's toys are scattered on the chair and floor to the left: carved animals, probably from a Noah's Ark, on the chair, a picture-book lying open on the floor, with a tilted, barrel-bodied wooden horse just beside it. The little girl grasps a frazzle-haired doll, and holds some small thing – it looks like the chain of a silver pocket-watch, perhaps her father's — to her mouth. The bright reds of the painting, on the curtain and the little boy's jumper, also give it a natural, cheerful atmosphere. But the woman herself is unmistakably dressed in mourning, and behind her sits an older man, probably her father, reading his newspaper. It is likely that she is a widow, perhaps living with her parents again. 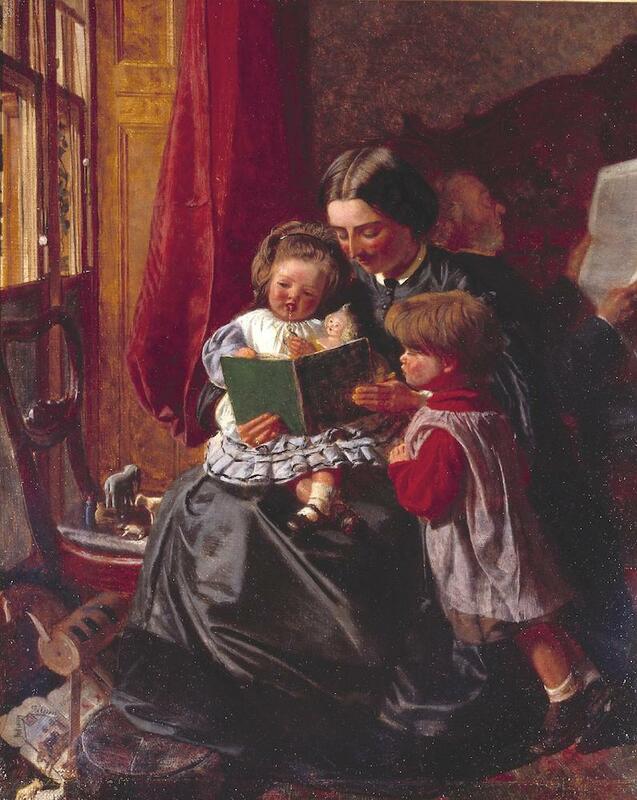 This possibility makes the painting, including the little girl's attachment to the pocket-watch, unexpectedly poignant. — Jacqueline Banerjee (with thanks to Winchester Bookshop @winchester_Bookshop on Twitter for suggesting that the small object in the girl's hand is a watch).